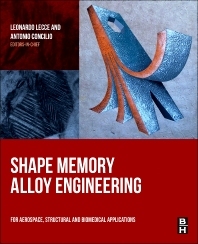 Shape Memory Alloy Engineering introduces materials, mechanical, and aerospace engineers to shape memory alloys (SMAs), providing a unique perspective that combines fundamental theory with new approaches to design and modeling of actual SMAs as compact and inexpensive actuators for use in aerospace and other applications. With this book readers will gain an understanding of the intrinsic properties of SMAs and their characteristic state diagrams, allowing them to design innovative compact actuation systems for applications from aerospace and aeronautics to ships, cars, and trucks. The book realistically discusses both the potential of these fascinating materials as well as their limitations in everyday life, and how to overcome some of those limitations in order to achieve proper design of useful SMA mechanisms. Prof. Leonardo Lecce graduated in 1971 with honours in Aeronautical Engineering at the University of Naples Federico II where he spent his academic career. He retired from Full Professor of Aerospace Structures, on September 1st, 2016. Since 2000 to 2006, he had the Aeronautical Engineering Department Chair. He has supervised more than 250 Graduation and 20 Doctoral (PhD) theses. He has been a member of the EU Expert Commission for the evaluation of research proposals many times. He has taken up appointment as a member of the Scientific Committee at the Italian Aerospace Research Centre (CIRA) many times, too. He is a member of the Board of the Italian branch of the Advisory Council for Aeronautics Research in Europe (ACARE), and since 2006, he is a member of the Executive Committee of the European Association of Structural Health Monitoring. Founder of the ex-Alumni Association of the Aerospace Engineers at the University of Naples Federico II (AIAN), he was its President for many years. In 2013, he was named President of the Italian Association of Aeronautics and Astronautics (AIDAA), after having directed the Naples Chapter since 2010. He is currently the CEO of the company Novotech - Advanced Aerospace Technology S.r.L. Retired, Full Professor of Aerospace Structures, Department of Industrial Engineering, University of Napoli “Federico II”, Napoli, Italy, and CEO of Novotech - Advanced Aerospace Technology S.r.L. Dr. Antonio Concilio took his degree in Aeronautics Engineering with honour at the University of Napoli “Federico II” (Italia) in 1989; there, he was also awarded his PhD in Aerospace Engineering in 1995. In 2007 he completed the ECATA Master in Aerospace Business Administration, at ISAE-Supaero, Toulouse (France). He supervised more than 10 Doctoral (PhD) theses. Since 1989 he works as a Researcher at the Italian Aerospace Research Centre (Italia), where he is currently the Head of the Adaptive Structures Division. Since 2005, he is a lecturer at the PhD School “SCUDO” at the University of Napoli “Federico II” (“Introduction to Smart Structures, Theory and Applications”). He is author of more than 150 scientific papers, presented at conferences or published into specialised journals.